The contours of natural talent, education, and unlimited personal support from his family all blend together for young Taiwanese/American violinist Paul Huang, who came to Juilliard’s Pre-College division at age 13. “It meant a lot of changes for my family, when my mom came to New York by my side, parting from the family and its business, a small pharmacy she ran together with my father back in Taiwan,” Paul remembers. Paul’s mother made the decision to leave behind Paul’s older brother and his father, dedicating five years of her life to Paul’s musical education, fostering his growth as a budding virtuoso. “Looking back, I feel so much appreciation for her utmost devotion, she never went out except for grocery shopping, always staying home for me,” says Paul, who remains closely connected with his family through tools like Skype and daily phone calls, but clearly feels like a New Yorker today. “Artistic growth like this does not happen there; the teacher tells you what to do…here the teacher encourages you to teach yourself, finding your own voice – that’s an even bigger lesson,” he says. “Of course I don’t know yet where my life is going to take me, but right now it’s happening here [in New York. ]” While Paul visits Taiwan on a regular basis, he has clearly made himself a home in the metropolis of music-making, “living [his] dream,” as he proclaims, which revolves around the instrument that took center stage for him as soon as he heard it performed for the first time as a young boy. “I seek inspiration wherever I am, and [in] whatever I do, living very much in the moment,” he says, describing his morning’s jog in Central Park, during which his eyes and ears were wide open, taking in nature’s wonderful sights and sounds. “There is always a new corner I have not yet discovered, birds singing, people to watch…sometimes, when you feel stuck and hopeless, you need to get inspired in order to inspire others. That is a talent in itself,” he explains. Paul likes to take advantage of the city’s broad variety of art and concert offerings. Sometimes, when he is inspired by great performances, Paul will pick up the violin right after to practice, even at 10pm at night. “Listening to a great performance makes you want to play better,” he says, starting his daily practice with Bach, a composer whose works he does not feel quite comfortable performing publicly yet, but whose music takes him on an inner voyage, reflecting on his own, personal state of mind – in all its glorious and self-revealing solitude. “With Bach, there is nowhere to hide, in a musical sense you are totally exposed, and it’s reflecting on who you are and where [you are] at this point in time with total honesty,” he says. Choosing his performance repertoire as a young performer, he realizes the importance of being familiar with a great variety of programs, although his heart truly beats for the late romantic and 20th century genre. “I never play music I don’t love,” he says, and that is palpably clear in his performances, which display his distinct individual musical voice, already lauded by many critics. Beyond that recognizable personality, there is an element of absolute necessity in his playing, making listening to him a gripping experience. “I never try to be different for the sake of being different; I rather always look for what’s meaningful to me and try to convey that as best as I can, but I do treat every performance as if it was my last one,” he says, explaining the emotional intensity of his recitals, in addition to his “stylish and polished playing,” praised by The Strad. 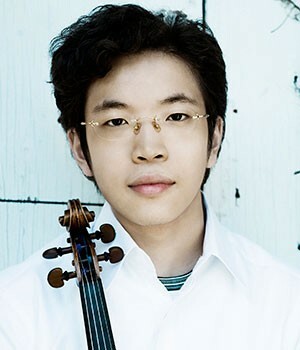 After winning the 2011 Young Concert Artists’ International Auditions and its 2012 Helen Armstrong Violin Fellowship, the young artist, who had already worked on collaborations with internationally acclaimed artists, began working with management geared towards moving his career in a distinct direction. One chamber music collaboration that came about through YCA was between Paul and the talented young pianist Louis Schwizgebel-Wang, BBC New Generation Artist 2013-15. The project resulted in instant friendship: “Although we just live two blocks away, we had never met in New York, before,” Paul says. A presenter in North Carolina was looking for a collaborative performance of Beethoven Sonatas, and, since YCA often promotes their artists together, Louis, winner of YCA’s 2006 auditions, was brought together with Paul to take on the task. “We immediately clicked while rehearsing Beethoven, and a close friendship developed further on many following concert tours together. Chamber music is the building block for any kind of music making. For me, it’s the absolute pinnacle of music making,” Paul says. For the 2015-18 seasons, he will join Chamber Music Society of Lincoln Center’s CMS Two program for young, up-and-coming artists.